I wrote the story below about two years ago. It is the story of a friend of mine who had a ghost in her house. I had not seen my friend in awhile and decided to call her for a lunch date. She told me I should re run the story about the ghost who has been living with them but to wait until we have lunch together as she had an update to the story. Let me start by telling you the original story of my friends ghost. My friend and her family are a average American family living here on Long Island in New York. They live in a average neighborhood in a modest comfortable home on a friendly street. All is well and normal in their world except for one small annoying intrusion. Since they have lived in the house , especially around the holidays, the family has been dealing with a ghost in their house. This has been going on for over 40 years. The house was originally built by a young couple who had two little kids and a grandfather who lived with them. The grandfather lived on the second floor and loved his home. He had a sitting room on the second floor with a bedroom and private bath. Outside he kept roses and flowers that he loved and tended with care. Both the young husband and wife worked full time jobs. The grandfather watched over the children until the couple returned home at night. The family seemed typical to the other families in the neighborhood. The granddad was happy to be with his family and tend his roses. He was content with his life. Often you could find him smoking his pipe waiting in his rocking chair on the front porch for the children to return from school. Life seemed to be working and happy for this family. It started during one hot summer. The young couple began to fight. The young man started to drink heavily. Often you could hear yelling and loud arguing erupting from the house. The neighbors began to talk. Eventually the people on the street had to call the police when the fighting became too loud or violent. Often the neighbors could hear doors slamming and furniture being thrown against walls. By the fall of that year gunshots were heard a few times and the police were a constant fixture at the home. The family was dissolving. The old grandfather was caught in the middle of a terrible situation. It was a difficult time. The couple divorced. The wife took the children and moved away. The young husband placed the house for sale. The grandfather had to be placed in an old folks home. Word had it his heart was broken. The family, my friend, who now live in this home were the people who bought the house from the young husband. That was over 40 years ago. They are a lovely happy normal family who have loved , taken care of and enjoyed the house all of these years . They raised their children in the house and have kept it in good condition, including trying to tend to the large rose garden that came with the house. This family also has put up with the grandfathers ghost all of this time! It is said that the old man did not make out too well once he left his once happy home. He hated the old folks home and only lasted a few years before he passed away. My friend and her family who now own the house started to notice odd activities around the home from the time they moved in to it. . It would increase around the holidays. Often when the family would be sitting in the dining room eating they would hear the front door open and someone walk up the stair case to the second floor. The family would call out to see who was there without any reply. They would search the house to find it empty but for the family members who were sitting at the table. This odd activity would often increase around Christmas time. The family would hear someone slamming doors or footsteps overhead on the second floor of the house while s they sat in the family room on the first floor. Again. they would search only to find an empty house. I ran into my friend who owns this house a few years ago when I was Christmas shopping. I asked her at the time if she was still having ghostly problems? She laughed and told me that the old grandfather was still with them. She told me he still brings his smelly old pipe with him too! I was amazed at how matter of fact my friend was about sharing her home with this ghostly invasion. I wondered if she ever feared the ghost or if she ever thought about bringing in a ghost hunter? I remember the day she told me that on the day I ran into her while we were both Christmas shopping I could not help notice in her basket a bunch of red stockings with the names of her family written on top of them . I had to smile as I looked at the pile of stockings as right on top of the pile was a stocking with the name Grandpa written across it. I had to envy how easily this family was handling the strange encounters of their live in ghost. 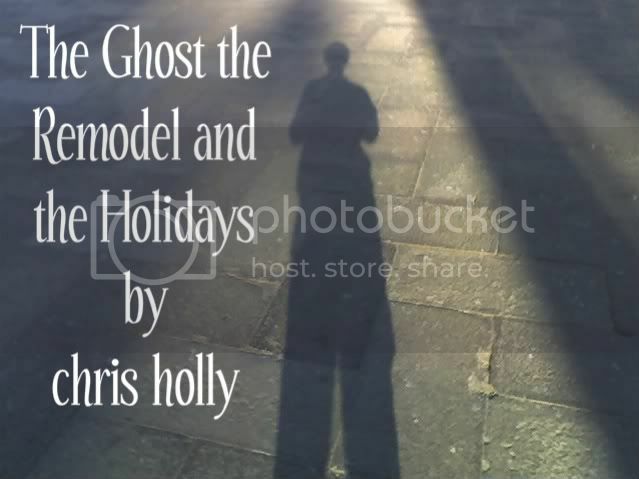 I could not wait to meet my old friend for lunch this year as I was curious to what was happening with the family ghost. Once at lunch my friend filled me in on the ghostly update..
My friend told me that since we had last seen each other she and her husband did a large addition and renovation to their house. She told me they demolished the front of the house adding new rooms and a new entrance to the house. They moved the stair case to the back of the house and enlarged the bedrooms on the second floor. They also added a large deck and pool to the back yard and had to pull out the old roses and plant new ones in another area. She told me the ghost reacted when the work started by throwing the tools of the men working on the house or moving them or taking them to never be found again. He would push the men who worked alone hard enough to make them lose their balance and fall over. The carpenters were frightened which often caused delays and problems for all involved. She told me he would pull down sheet rock and bang on the floors and walls frightening the men trying to work on the remodel. My friend told me that this went on until the day the roses were removed. She told me that was the last day they ever saw or heard or smelled the pipe of the ghost of the old grandfather. Since the house remodel was completed they never again were visited by the ghost . My friend feels that the grandfather ghost finally moved on . Once the house was no longer the one he knew he did not seem to want to stay. Once the roses he loved were removed and replaced with the deck and pool the ghost seemed to lose interest in staying on and simply moved on. I guess we changed the house to the point he did not feel he belonged here any longer. She added that she and the other family members felt it was a good thing for their ghost to move on to a better place and feel he has finally found his peace.. I could not help wonder if she kept that stocking with his name on it. When I asked her about it she laughed and told me the stocking goes up every year. She told me that after 40 years of sharing the house with him they want him to know he is always welcome- especially during the holidays! I find the manner in which this paranormal event was handled by my friend and her family one in which they accepted the unknown as simply something they did not fully understand but also something that was not completely out of the ordinary. They felt the grandfather needed to stay for awhile and they allowed him to. He moved on when he was ready . I do not know if I could be as easily going with a ghost in the house . I do know I did learn a new way at looking at something that I once considered extreme with new eyes and realize sometimes we just need to relax and let things be. I truly wish my friends and all of you the love and happiness of the Season and Happy Holidays to you too Grandpa!